Big Bird on my plate !! olives & Canary melon/yellow melon beak . Ha....that's cute! My son will for sure love it! Awww so cute .... off to the kitchen to make one for my boys too !!! So cute! That is a good way of being creative while husband and daughter are in another world while playing their game. It sounds familiar: I am also only a books&magazine(and foodblogs ;-)) person myself. Wow, your blog is AMAZING! I really struggle to get my daughter to eat much at all, can't wait to have a look through your blog for ideas! Too cute. Thank you for stopping by DIY Home Sweet Home. I'm following you now as well. Wooow .. so lovely. Came to ur blog via FB, and i am glad i did... Lovely creations..., my kids would definately love them.. 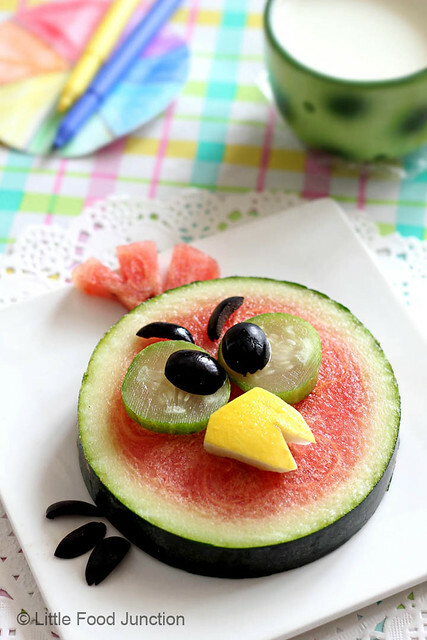 Very cute looking bird made by fruits. looks great, can also be used as centerpiece on summer table.lovely! Adorable, I wanted to stop by and say how cute this is!!! This angry bird is too cute..!! i love this, simple but very cute! Super cute! Thanks for linking it up at Bento Blog Network! Thanks for posting. I had to pin this on pinterest. I gave your blog the credit. Hopefully I did it right!